Look at that cooool Totoro card! Be sure to scroll down & see the stickers on the back, too. A Postcrosser in Seattle, Washington sent this to me in a Postcrossing Forum tag trade. Right next to Totoro is a scene from Singapore’s very colorful Haji Lane. I was able to request that card in another Postcrossing Forum tag–from the same person I’d received a similar card in this tag, a few months ago. “Greetings from Malaysia–a very warm country in South East Asia (avg. temperature: 30C). Malaysia is a country with multiple cultures and religions. Despite what the news have said about us, we still live in perfect harmony and celebrate all festival together. I grew up in a small town call Cameron Highlands, a famous cool hill resorts which had average temperature of 16C throughout the year. It is famous for its tea growing, vegetables farming and flower nurseries. Now I live in the capital city–Kuala Lumpur. But I still visit my parents back in Cameron Highlands during holidays. Panda time: it comes from China, in another PF tag trade. Also from China is that colorful Shanghai skyline, sent to me by an Instagram friend who’d been noticing my postcard posts, and put out a call to his friends who would like to see postcards while he was traveling in China & Taiwan. Oh, there’s a story behind that orca card. And by behind it, I mean regarding the back side. I flipped the tag over to find a taped-on block of orca info printed out from Wikipedia. C’mon. After that, the sender jammed in a handwritten hi-how-are-you-hope-you-enjoy-this-card-take-care, and a scrawled hieroglyph of an initial. I know the card came from Seattle, Washington, because it was clear in the postmark (clear postmarks never being a guarantee), but I didn’t know the venue (Postcrossing Forum? swap-bot? ), or the user name. I had to spend some time going through my inbox looking for possible senders of this card, then trying to match those possibilities with locations in their profiles. UGH! End rant, let’s go to Manila, Philippines. This card was received via Postcard United, and the sender tells me about “the Philippine jeepney–a unique mode of transportation here in my country.” They sound like an adventure! Next, from Athens, Greece via a tag trade, comes the candy package, the contents of which are described by the sender as “ION Baloo, amazing butter candies.” Onto the back of the card, she glued a panel from a box of tea I assume she also likes. Scroll down & you’ll see it. Another Postcrossing card: it’s the cannon, & it’s from a real estate agent in Moscow, Russia. He printed out his message & glued it to the card–I’m assuming it has to do with English skills. This reminds me of another card I received recently, which I guess I’ll include in a later post (if I don’t lose it). Okay, time to look at all of the stamps, stickers, & stuff. The Totoro on the 1st image looks like a stamp, but is just part of the postcard printing. 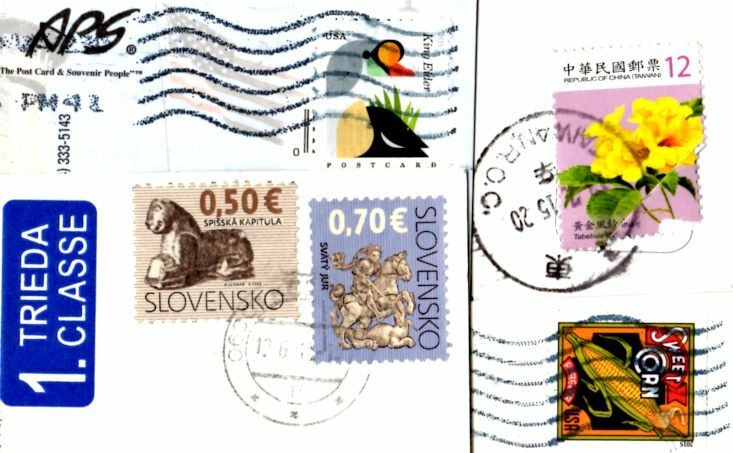 My favorite 3 stamps down here, in order of scrolling appearance, are the spoonbill (U.S.), the chicken (Singapore), and the flowers (Malaysia. How about for you? “My Husband Does Not Like Your Country:” Received from Germany, Russia, Taiwan, & the U.S.
Mail call! And there were enough interesting lines from my correspondents this time, that I had a hard time deciding what to entitle today’s entry. You’ll see. 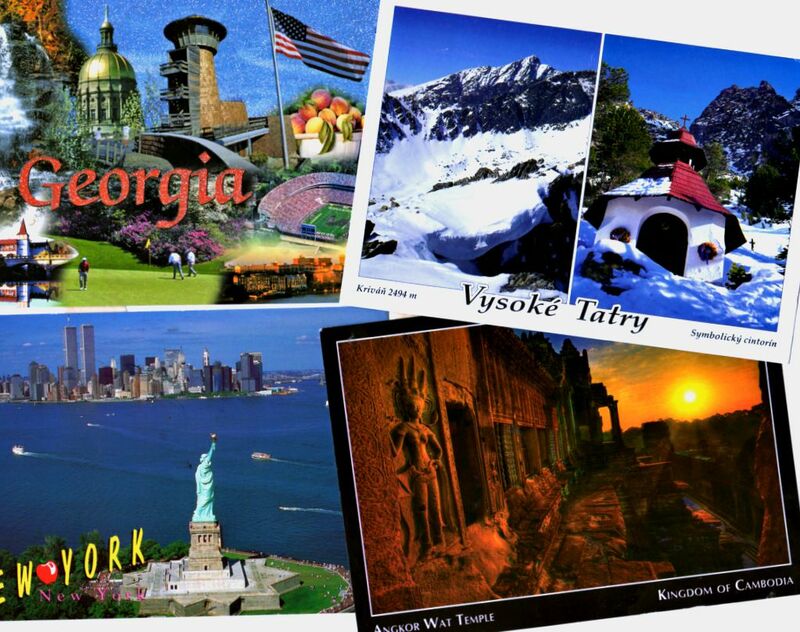 The first two postcards are regular Postcrossing in-comings, and the second two were received via trades on Postcrossing Forum. Yay, seeing off the winter! Good riddance, Buster! I am glad she clarified “round trip;” for a moment I thought she might just stay here, leaving her Mister to his Greek island. Stamps, postmarks, & washi tape: I love everything on the card from Taiwan! No Postcrossing/swap-bot action here: this is a great-big envelope I sent off to a friend! The occasion is the Lunar New Year–and I did send a few specially-purchased Year of the Monkey goods–but as usual in the packets of madness I send out to friends, the “good stuff” is surrounded by a wealth of random bits I have accumulated for the purpose of amusement: stickers, trading cards, stuff that surfaces in fits of decluttering…all sorts of odd bits & ridiculousness. The collage on the right is the back of the big envelope. On the front I have stamped the little Snoopy scene you see on the left. This uses all of the stamps I received in the “Snoopy Madness” order I shared recently in this space. I’ve been using the mailbox stamp in my postcards going out this week, but this is the first time I have used any of the others in the 4-stamp set. I always look forward to hearing my friends’ reactions after they’ve received my li’l mail surprise packages. Not all people have the personality or intelligence to know how to react to this kind of fun, but this particular friend always reports that his office mates (ohh, yehhh, I send them to his office) are always amused & fascinated whenever these periodic mail days come. Do you create wacky packages of your own, to add a little lunacy to the days of the people in your life? Tell me about it! I know what she is talking about. I don’t know Helen, but here in California, we have our own cheesy town: Solvang. The card I sent to Worclaw, Poland has arrived! It traveled 8 days and 5,828 miles. Now, I get to send out another card through Postcrossing. 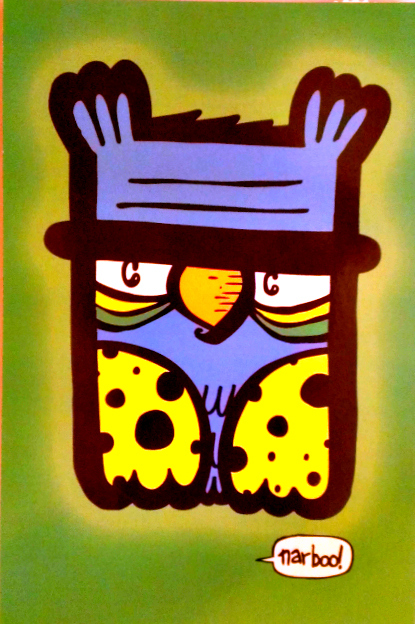 If you ever spend time in Seattle, you are sure to see this guy ABSOLUTELY EVERYWHERE. Okay, this card has nothing to do with Postcrossing or swap-bot; I actually sent it to a friend of mine who is known as a squirrel whisperer. 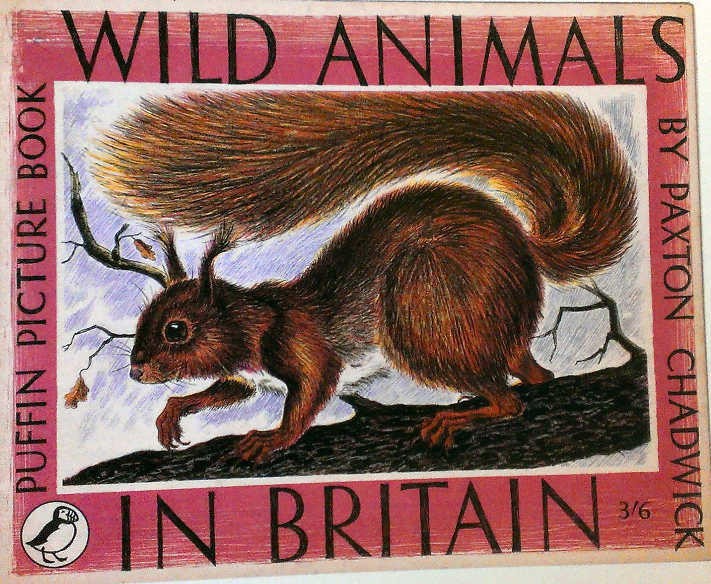 As I wrote on the back, when I found this squirrel card in my postcard stash, I thought: why would I send it to some complete stranger, when I can mail it to the strange person I know? I absolutely love squirrels, but I don’t want to feed them. They are brilliant & agile & perfectly able of fending for themselves, plus, I’ve read coverage of incidents at a local park where bold squirrels jumped into strollers to grab the kids’ snacks right out of their little hands. Simultaneously hilarious & scary. I shared a Facebook link on the flip side of this card to my friend; it’s about a squirrel I heard about last night while listening to NPR. Sneezy the Penn State Squirrel lets his special human friend dress him up while he snacks.